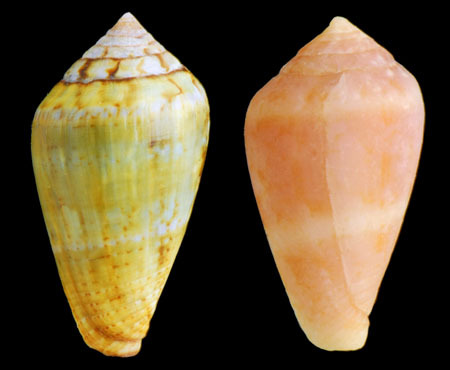 In 1990, José M. Lauer compared specimens of Conidae that he collected on the island of Tenerife, in the Canary Archipelago, and specimens of Conus guinaicus Hwass in Bruguière, 1792 and Conus ventricosus Gmelin, 1791. 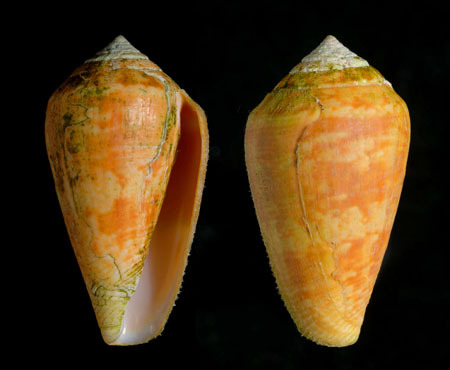 He deduced that his samples concerned a new species which he would describe in 1993 under the name Conus Guanche in reference to the Guanches, the first known inhabitants of the archipelago. 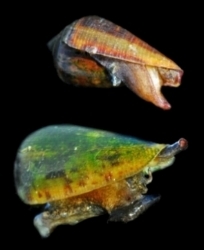 The holotype deposited at the National Museum of Natural History in Paris was collected in the rocky intertidal zone of Punta Blanca on the west coast of Tenerife and measures 34 mm long and 18.2 mm wide. The author indicates an average size of 27.55 mm for a height / width ratio of 1.81. He describes a moderately elongated shell, slightly russet, smooth and not very bright. The intermediate multispiral type protoconch precedes a rather low teleoconch with 8 to 9 turns and a convex shape becoming less pronounced with age and a well-marked suture underlined by a thin brown line. The last turn is slightly rounded, becoming straighter in the anterior half with a smooth texture to the basal quarter, showing 9 to 11 small spiral cords. The narrow aperture widens anteriorly, revealing a purplish interior prolonged by a yellowish lip, thin and sharp. As for the pattern, Lauer indicates a very constant one with few variations: the background is gray-blue, the spire shows brown radial lines more or less numerous, the last turn is decorated with black or brown zigzags. The animal has a dark gray foot, a pale sole, a black siphon and secretes a translucent green-brown periostracum. The author also mentions a subspecies C. guanche nitens, which is distinguished by a higher spire, a deeper suture, a less rounded last turn and a less dense and lighter pattern on a beige background. Here are some personal observations on Tenerife, which partly join those of Lauer on the ecology of the species. 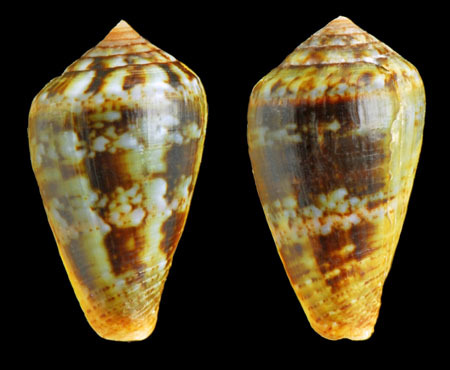 Conus guanche lives in very localized groups of individuals on all the coasts of the island with a preference for rocky substrate in the intertidal zone, which explains the very great difficulty of obtaining specimens in good condition. It is most commonly observed in basaltic depressions with few moving stones and a layer of resistant algae that retains the sand. At low tide, the animal takes shelter in shaded cavities protected from waves or buries in the small pockets of gravel at the bottom of puddles, except during the peak of the breeding season in May-June which pushes it to move permanently. It shows a diurnal activity about an hour after the low tide and can move in zones exposed when the temperatures are cool. It feeds on Polychaete worms, including Perinereis cultrifera (Grube, 1840), and possesses a radial tooth typical of vermivores, with a single barb that complements a slightly serrated blade. The operculum is present but very small, fixed on a strong foot, gray or cream in color and marbled with black. The cephalic tentacles and the interior of the siphon usually have a pinkish or purple tint. Conus guanche lives in sympatry with Conus guinaicus in at least two areas near Los Christianos and El Médano in the south of the island, which is the only possible source of confusion. The stability of the motifs evoked by Lauer is quickly ruled out when it is possible to compare harvests from different origins. The species has been observed mainly on the eastern islands of the archipelago, from Tenerife to Lanzarote, and its endemic character is mentioned in numerous publications, although specimens are regularly harvested in Cape Verde, Morocco or Mauritania. The specimens of La Graciosa Island are lighter with spots that are spaced apart, whereas those of the island of Lanzarote have a more homogeneous coloration in beige tones, and those of Gran Canaria Island are usually darker with a denser pattern. But beyond these tendencies, we can observe on the field peculiarities to each colony. To illustrate, I will mention three localities of Tenerife: Los Silos on the north coast, Puerto de Santiago on the west coast and El Medano on the east coast. The specimens observed at Los Silos live on small flats hardly uncovered by a large coefficient, at the foot of a cliff beaten by the waves, and gather on the protected side of the rocky spurs. These shells are medium-sized, between 25 and 29 mm high, with dense brown spots and a coarse pattern that sometimes extends over a large area on the shell. In Puerto de Santiago, the density of individuals is very low and concentrates on about 200 square meters sheltered from the main swells by a rocky outcrop, which presents at low tide a succession of shallow depressions and pebbles. The shells have a higher average size than elsewhere, ranging from 29 to 40 mm, reaching even 42 mm for an old specimen, but are extremely eroded and covered with heavy calcareous crusts. The pattern is typical but not very dense, with a slightly yellower background color. The coastline of El Médano shelters a colony of small specimens, between 19 and 24 mm high, on a rocky flat surrounded by black sand beaches. The area is well sheltered from the main swells and the puddles retain a thin layer of gravel. Here the shells are decorated with fine patterns with typical zigzags and numerous dotted spiral lines. The background is bluish or greenish and a lighter spiral band is almost always present at 2/3 of the height. A final note concerns the yellow and the orange forms that develop among the colonies of typical specimens, and are almost always observed between Los Gigantes and Alcala for the first, and between Playa Paraiso and La Caleta for the second. The morphological variations are therefore quite large and seem to be directly related to the living conditions of individuals. It is possible that further studies of the genetic material of certain populations, particularly those of Fuerteventura and Lanzarote, reveal specificities. Moreover, colonies are sometimes limited to a small shore area and it is possible that certain small hereditary characteristics remain local and that peculiarities appear on the same island. 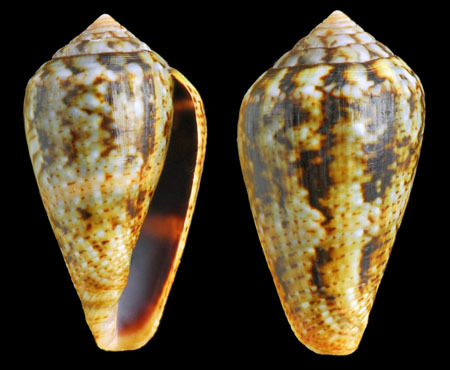 Collectif, "Patterns of Cladogenesis in the Venomous Marine Gastropod Genus Conus from the Cape Verde Islands", Systematic biology, Vol. 54, Society of Systematic Biologists, Oxford, 2005.